MouthWatch TeleDent solves the technical and administrative complexities of implementing profitable teledentistry. TeleDent™ allows teledentistry to be introduced without major investment in hardware or software development, and lets providers expand their reach to patients without the need to build out more operatories or hire more staff. MouthWatch has created the world’s first turnkey and fully integrated teledentistry system, making it easy to offer patients improved access to dental care, regardless of the patient’s location. 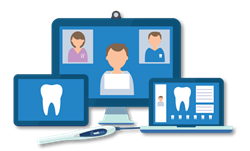 Using TeleDent™, providers can offer both asychronous (or “store and forward”) evaluations and live video conferencing, including both radiographic and intraoral images. Teledentistry is the newest entry in the rapidly growing field of telehealth, which promises to connect medical professionals to patients who need care or guidance, regardless of location. While telehealth has been effective in improving care and treatment across a range of medical specialties, teledentistry has been slow to arrive in dental practices, public health programs and community clinics. These providers are often not prepared to address the technological requirements of teledentistry, ranging from HIPAA-compliance to creating efficient methods for managing remote patient evaluations. TeleDent™ is positioned to effectively and affordably address these issues. Until now, the technical and logistical challenges of implementing teledentistry had delayed the expansion of access to oral care across the country, leaving nearly 40% of the population unseen by a dentist in the past year and 1 in 7 Americans with limited access to dental care. Delayed dental care leads to poor oral health and more expensive treatment while simultaneously resulting in lost school/work days and an increased risk of heart disease, diabetes and other chronic conditions. TeleDent™ can have a major impact in increasing the number of patients seen by a dentist. MouthWatch, LLC was formed in March 2012 with the mission to improve communication, dental care, education, and connection between dentists and their patients through teledentistry. MouthWatch is the first and only product on the market that easily, securely, and affordably puts these technological advances in the combined hands of the patient and dental practitioner. MouthWatch will be introducing TeleDent™ May 12-14 at CDA Presents in Anaheim, California at Booth #2341. For more information, contact Brant Herman at 877-544-4342 ext 501 or e-mail brant(at)mouthwatch(dot)com.